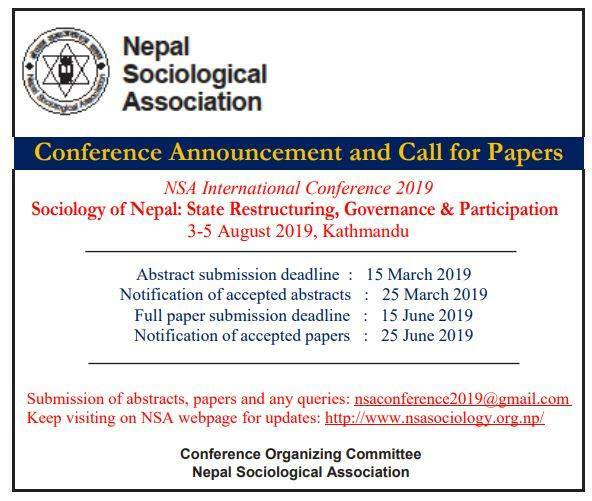 Nepal Sociological Association (NSA) invites submission of papers from interested individuals and institutions for an International Conference to be held in Kathmandu on 3rd to 5th of August 2019. The conference aims to provide a platform for the social scientists to discuss and analyze Nepal’s development issues. The theme of the conference is “Sociology of Nepal: State restructuring, Good governance and People's Participation”. However, the papers related with any aspect of social life of Nepal are also welcome. The abstract should not exceed the words limit of 300 words. The title of the paper, a short description of research method and major arguments/findings should be clearly stated in the abstract. A one-page CV of the author should be attached along with the abstract. The full paper should not exceed the words limit of 6000 words. For formatting, citations, referencing, bibliography, etc., please follow either the APA or the ASA style guide. All the paper presenters are expected to make their own arrangement for travel and accommodations.